153 water advisories remain in effect across First Nations communities despite their role in conserving our nation’s water resources. 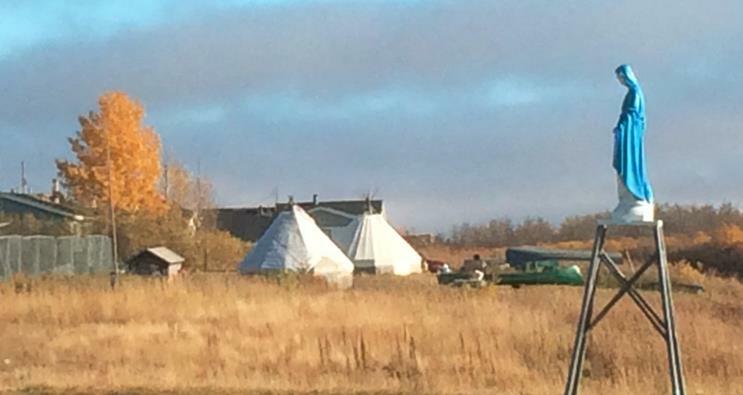 First Nation communities across Canada continue to struggle while billions of dollars are extracted from their traditional lands. And there are others. This situation needs to be rectified. By building on the lessons learned and our genuine desire to do better, I believe there is a path forward, towards truth and reconciliation. Politics and emotions aside, there is a very practical reason why Indigenous rights need to be better understood and embraced by mainstream society: the long-term conservation of our shared natural capital resources. Despite all the turmoil they have experienced, Indigenous communities have maintained unparalleled connectivity to the natural world. Taking the lead from Indigenous communities, and becoming better stewards of our natural world, may be a small step forward towards reconciliation. Canada has a total area of approximately 9,976,185 km2 – wow! – stretching 5,187 km from east to west, and 4,627 km from north to south. 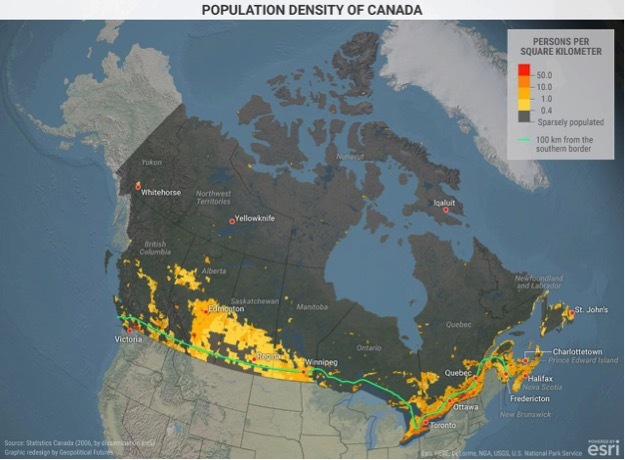 Of our 36.3 million residents, approximately 90% of us live within 161 kilometers (100 miles) of the 6,416 km-long mainland border with the good old U.S. of A. (see Figure 1). Most of these areas consist of urban and rural communities that are governed by organized municipal governments who employ planning policies and documents – such as Official Plans – to guide development and regulate the consumption of natural capital resources upon which communities nestled under their jurisdiction depend. A good system, which is progressively getting better. By my math, that means that about 32.67 million Canadians live in and consume natural capital resources from an area covering about 1,032,976 km2, or about 10.3% of Canada’s total area. That would explain all of the empty green spaces in the northern part of the map. It also begs the question: who is taking care of natural capital resources in the other ninety percent of our country? You got it – Indigenous people…and they’ve been taking good care of it for a very long time. Of all the varied constituents of Canadian society, Indigenous cultures (including First Nation, Inuit and Métis people) have the greatest appreciation of the value of natural capital – again, for good reason. These cultures have literally depended upon the wise use of natural resources to survive (and thrive) for generations. While “mainstream” Canadian society assumes a certain responsibility for conserving natural capital – but undoubtedly consumes a disproportionate amount of it on a per capita basis – the onus for conserving the vast majority of Canada’s natural capital resources has always rested with our Indigenous societies. Traditional land use systems have proven to be sustainable, not just in Canada but around the world, yet they remain vulnerable if the dominant trains of thought and resultant practices fail to value the important ecological principles upon which traditional systems are founded. Given the sheer size and diversity of habitats that the ninety percent encompasses, it’s not surprising that the natural capital resources contained therein provide numerous globally-significant ecosystem services the global “human village” rely upon, most prominent among them gas and climate regulation services vis-à-vis carbon sequestration. These areas also provide key local ecosystem services that benefit the Indigenous communities located within these areas. (mostly for food, water and for cultural reasons). This is reflective of the way that Indigenous societies see the natural world as a “provider” – Mother Earth – rather than modern society’s perception of our planet as an infinite source of exploitable resources with the sole purpose of serving our needs. This basic difference in perceptions is the key to understanding…everything. It is probably the most valuable lesson that modern Canadian society can learn from the traditions of our Indigenous people. One example I’ve described before is relevant to this discussion: the Hudson Bay lowlands cover an area of about 325,000 km2 in northern Ontario, with most of this area consisting of peatlands that form the largest wetland in North America. A portion of these peatlands – about 72,000 km2 – fall within the traditional land bases of the Attawapiskat, Fort Albany, Kashechewan, Marten Falls, Webequie, and Winisk First Nations, and provide carbon sequestration services that have been valued at approximately USD $2.6 billion annually. In addition to providing globally-significant gas and climate regulation services, this area also provides critical habitat to a number of keystone species, such as woodland caribou, polar bears, moose and grey wolves, as well as numerous species that are food for their First Nation stewards. Yet none of these communities are being adequately recognized or compensated for their stewardship role, despite living on and caring for these lands for millennia. The truth of the matter is that Indigenous communities are the primary caregivers for the vast majority of Canada’s natural capital resources, which provide key ecosystem services to the global community. My argument as an ecologist and a planner has always been that traditional land use and modern planning systems can co-exist, and natural capital is a primary beneficiary of such a hybridized approach. As I stated in a previous blog, if we’re really going to assign an economic value to natural capital, then we’d better be prepared to back it up, and investing in Indigenous communities represents a direct investment in natural capital. Support – financial, skills/capacity building and re-engaging youth with the environment- should be provided to these communities, at a level commensurate with the value the rest of the world places on the ecosystem services they are safeguarding. I’m not sure how this would relate to our government’s commitment to Truth & Reconciliation or our government’s endorsement of the United Nations Declaration on the Rights of Indigenous Peoples, but it would surely be at least a small step in the right direction. Indigenous peoples’ commitment to the natural world is far beyond anything that is understood by “modern” society, yet we have all benefited from it. And not just in Canada, but anywhere that Indigenous people call home.The humbling acceptance of that may just be enough to jolt me out of my complacency and persuade me to actually do something. Maybe I’ll write a blog about it…and maybe you’ll read it. And maybe you’ll take a small step forward too. Vince is a member of the Natural Capital Lab’s Innovation Cohort.